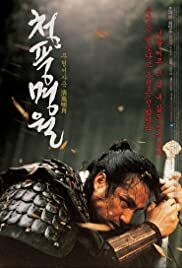 A series of high-ranking officials are being systematically eliminated by a sleek assassin and his female assistant, and arrogant master swordsman General Choi is charged with putting an end to the carnage. Amazing scenes. Great colors. As a fan of Asian movies I accept this one as a promise for more great ones. I can't say this is masterpiece because I am not into the Korean cinema - i saw only two or three movies , but hey don't forget Kim Ki Dook movies - so they are more than 3 :-) Anyway - Im not sure that I understand the final. But I got the idea - the friendship has not a time for existence. This is something that may have or may have not. I give 5 of 10, because of the idea, the costumes, the atmosphere. Although there is too much blood - I say bloodbath. The beginning was promising - I thought that it would be a medieval crime movie - because of the mysterious murders , but the point of the movie was not that kind. It is too deep to consider. May be I'm kind a disappointed because of the end: just like the "Spirited Away" - manga movie... But that does not mean the movie is not great.